In the words of Billy Connolly that infamous Scottish teller of tales, ” Christ is that the time already”. We can officially say our new life begins NEXT MONTH. Wowsers, it’s been a frantic month to say the least. I zipped over to New Zealand to see my parents, my brother and his family and caught up with several of my relatives at a lovely lunch ( thanks Aunty Colleen). I met up for dinner with old mates that had gone to school with my first husband and I had a great day out with our friends coming on the first world cruise with us next month. They get on in Auckland so will be on board welcoming us with cocktails in hand as we prepare for the sail away from the stunning Sydney harbour, ( well I hope they have those cocktails waiting). James was in charge of most of this and he did a grand job, people came from everywhere picking up chairs, tables, beds, dressing tables, filing cabinets,fridges, washing machine etc with such speed that we were vacuuming and mopping our way out the door in no time flat. This is when it gets difficult. We are fortunate to have our own private storage space so knew we could keep some things that were either too emotional to let go of or would just be silly to spend money replacing them some time way way down the track. Surprisingly our five children living in Australia didn’t take that much off our hands as most of them already have enough of their own treasures. I remember reading Lynne Martin who wrote ” Home Sweet Anywhere” talking about the stress of deciding what to sell, what to store and what to give away, how the moment you thought you had one room cleared out, it no sooner appeared full again. Lynne, I now really get it, and I remembered that chapter in your book as we were doing the same dance around our belongings, and I laughed out loud as I recalled your words. Lynne’s book is a great read for anyone contemplating the life we are hoping for. Also take a read of ” dancing in the fountain” by Karen McCann. A story of an American couple starting an expat life in retirement in Seville. It’s truly an awesome read and extremely funny. 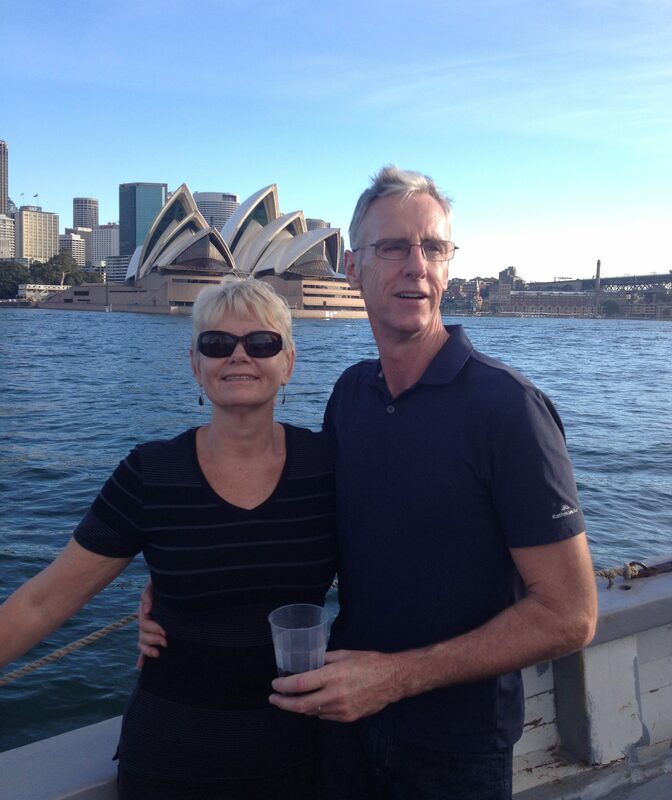 Debbie and Michael travel the world in their retirement using one Airbnb at a time. They have some great tips and stories too. Their blog is The senior nomads. Our idea is a little of each of these couples stories, and although we have initially planned quite a few of our destinations, this seems to have evolved through circumstances, chance and availablity with a little bit of well while we’re there…..but we are hoping to be a little bit more relaxed about booking next stops till we have had enough of where we already are staying. So normally we travel Carry on, and this is usually fine when we aren’t seeing the same people everyday for 104 days and we normally travel to warmer climates so a few warmer items have been sufficient, this first cruise will involve plenty of formal nights, off shore excursions of all varieties, some cooler weather and here’s the big thing….the luxury of not having to carry our luggage somewhere new every few days. James as a man has mastered the art of packing light by not needing more than a few pairs of footwear a couple of polo shirts, shorts, etc, you get the picture. I, on the other hand see this cruise as the last time I shall be able to indulge on a wardrobe of enough clothes and shoes to keep me out of the laundry for days if not weeks at a time. I’ll probably reassess this when I actually start packing and can’t fit that last number 15 “must have”pair of shoes in. Along with working out what we’ll take this trip I’ve been going over my list for when we leave again from here in September, mindful that we will be packing extra light and I’ll want it all together and handy for the 11 day turn around we’ve allowed ourself. We have packed a bag of medical supplies, toiletries and other items we feel would make our time on board more comfortable. This week saw us at the doctors getting vaccinated for all the different countries we may get to in the next five years or so before we may need any top ups. We almost needed to auction our house to pay for them all!!! but will be a great relief when we’re travelling to feel we have made some effort to stay safe and healthy. We also have to get a property ready for an auction that won’t happen until we are onboard and sailing somewhere near Sri Lanka… Typical of us, always down to the wire and this time we’ll have to leave entrusting others to do their magic for us. The next few weeks will be spent cancelling all those subscriptions, utilities and insurances we no longer need for cars, motorbikes and furniture we don’t own anymore. We now start the round of dinners, lunches and catch ups with family and friends as we prepare to say goodbye for now.